Visit Tanzania and take part in hiking the Kilimanjaro via the Machame route on this 7 Days Machame Route Kilimanjaro Hiking Safari. Contact us to book this safari. From the Shira Camp (3,845 m), you continue to the east, passing the junction towards the key point of the route Lava Tower (4,630 m). The climb is for some 5kms and will take approximately 8 hours. As you continue, your direction this section of the route has a lot of ascents and descents that end in a camp at over 4,600 meters. It might be difficult, and you may feel some discomfort, but in order to successfully acclimatize to the altitude you have to spend at least 1-2 hours here, and here is where you will have lunch. 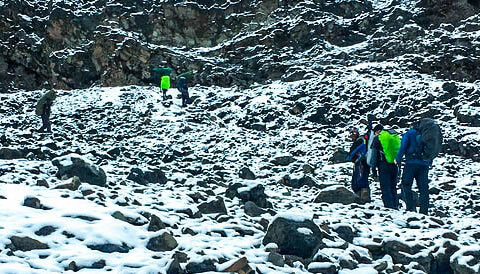 Now you will descend to Barranco Camp at an altitude of 3,960 meters. Here you can see the famous Barranco Wall, impressive in both its massive size and stiffness. Then the time to rest, enjoy dinner and overnight. End of the 7 Days Machame Route Kilimanjaro Hiking Safari.